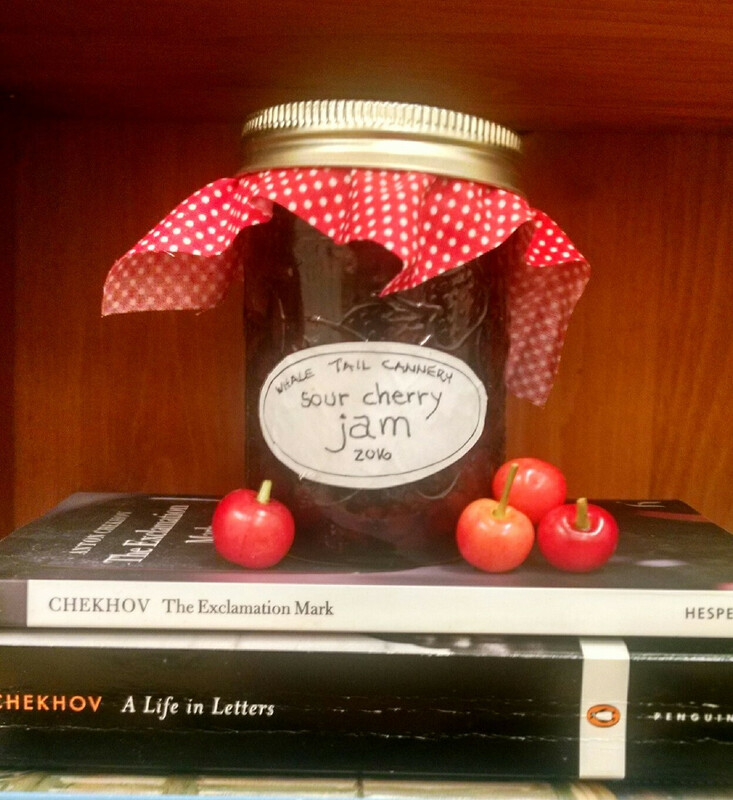 So what’s the fascination with cherries and Anton Chekhov? Well, I happen to love them both and I recently read a quote from Chekhov himself about cherries. It makes perfect sense, if you think about it, that Chekhov would gorge himself on cherries as well as life. He died of tuberculosis at only 44 yet he wrote hundreds of short stories and several plays (“The Cherry Orchard” is one of them). He also, and doesn’t this make you wonder what you do with all your time, worked as a physician. Chekhov’s “The Lady with the Pet Dog” is easily one of the most perfect short stories ever written. Its characterization, easy-tell-it-to-a-friend kind of style, and ragged yet satisfying ending are a model for me. He joins my bookcase along with William Trevor, Flannery O’Connor, and Shirley Jackson and poets such as Jane Kenyon and Charles Simic for my “go-to” authors. Until then, when I’m not writing, you’ll find me making jam with cherries I pick in someone else’s orchard or with raspberries and strawberries we grow ourselves.